Many people are having fun applying the principles from the Positive Discipline Tool Cards. When they share their great examples, I ask for their permission to share with others. Following you will find some helpful and encouraging examples from Katie and Tamee. I applied a few Take Time for Training strategies today during "room cleaning" day. In the past my procedure was as follows: "Go clean your room" the children would stay in their rooms for hours (why isn't it clean???) and eventually I, or someone else, would clean it. Today I decided to have a "clean room workshop." (I have a 6-year-old and a 2-year-old, and my roommate has a 5-year old and a 3-year-old.) I started with a "make your bed" tutorial for the 6-year-old. The 3 and 5-year-old watched and immediately rushed to make their own beds. They were so proud of themselves! Later, I broke down the rooms into small tasks for each child (clothes...stuffed animals...shoes, etc) and if they got off task I redirected them with curiosity questions, Where do the shoes/dirty clothes go? Could you help me with that? In 30 minutes, the three of them had cleaned up their rooms when normally it would have been an all day (sometimes all week) process. They also agreed that it would be easier to clean their rooms daily. Unfortunately, my two-year-old was the only one that did not cooperate. I tried to get her involved in tasks that she could do, but after the first request, she threw herself down on the floor and cried. I know that she knew that if she kept at it long enough, I would eventually pick her up, hold and coddle her, and I would complete the task I asked of her. So, I left her on the floor (told her I loved her, and that she was welcome to participate when she was ready) and instructed the other kids to ignore her, but be polite (excuse me). I think eventually she would have stopped, but dad intervened after 15 minutes, and picked her up. She sat with him while the others completed the tasks. We will just have to keep working on it. Katie made a great start with the older kids. 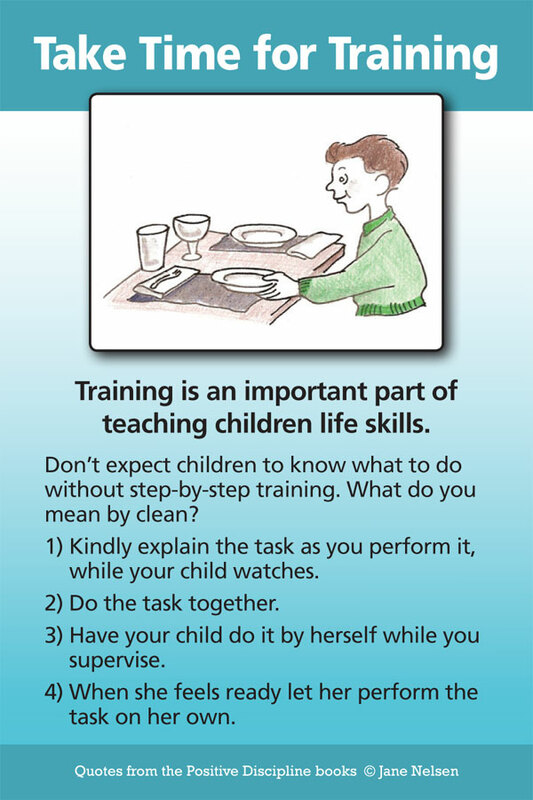 Her struggle with her younger child gives me an opportunity to point out that the way to take time for training with children under the age of six is to do tasks with them. Lets take making beds as an example. As soon as your child graduates from the crib, purchase a bedspread for her bed that has some kind of stripes. Then when making the bed with your child, you can teach her how to line up the stripes. You do one side and she can do the other. You can talk about the graduation celebration she can have when she is six and can start making her bed by herself. Before she is six she is likely to be looking forward to her graduation day. The following question from Tamee provided an excellent opportunity for me to teach about the Take Time for Training tool card. This morning my 5-year-old put a bunch of dirty dishes from the sink into the dishwasher. It made me happy to see her doing this. Afterward I told her that was very helpful. Then she said, "Since I did that for you, would you bring all my breakfast things to the table?" I didn't really think that was a good idea, since it would make doing dishes seem like something to do to get something in return. I said, "I'm willing to bring the gallon of milk out and pour it. You can do the rest." She started crying, saying it wasn't fair that I didn't do half of her breakfast things. It became a fit and she said, "Fine! I'll just do it all myself!" which led to her feeling sorry for herself, having to pour the big heavy gallon all by herself and blaming me for it....HELP! I asked Tamee if her daughter was used to getting rewards somewhere else? Tamee shared that her ex-husband and ex mother-in-law used rewards all the time. It wasn’t difficult to make this guess because her daughter’s behavior was typical of the long-term results of rewards. Part of taking time for training might be to make a game of it. "Let's find at least one thing to do for each other every day as a surprise and see how long it takes the other person to find out what it was." This could be expanded at dinnertime discussions by taking turns sharing, "What did you do for someone else today without expecting anything back?" We need to take time for training in many areas (such as manners and problem-solving) instead of expecting children to learn from our “lectures.” Children may resist the training you provide in your home (it is part of their individuation process—always testing how to use their power in a safe place), but your friends and neighbors will notice and tell you what a great kid you have. Get over your shock and keep taking time for training, even when it seems like it is not working.